There is no more important question in Christian theology today than coming to terms with the doctrine of hell. While that may seem like a bit of an overstatement, regardless of what is said and preached about God being merciful and loving, if the doctrine of hell is not brought into the affirmation in a truly integrated way, then it will leave people wondering if God really is merciful and loving. If we cannot preach and teach about hell in a way that is coherent with the biblical affirmation that God is love, then the lingering image of a vengeful and angry God will get in the way of our proclamation. 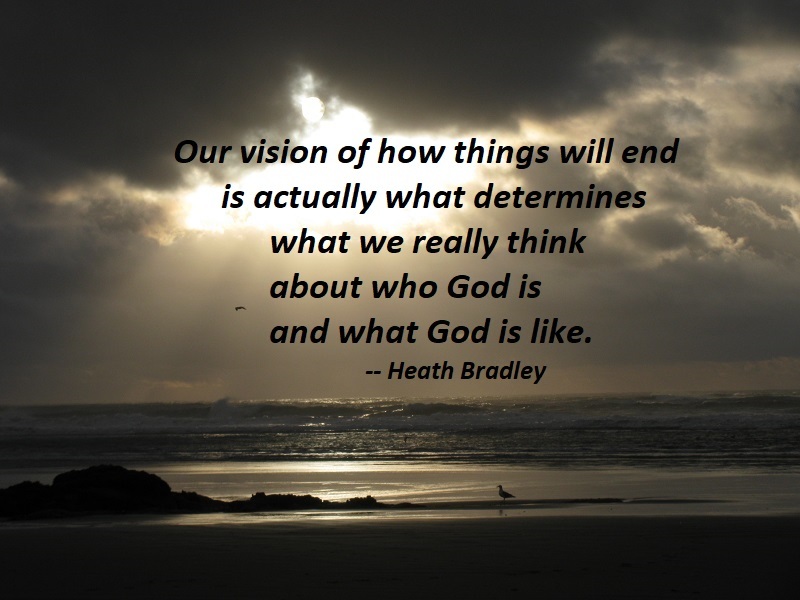 Here is what I have discovered: Our vision of how things will end is actually what determines what we really think about who God is and what God is like. To put it in words that would make my seminary professors proud, our eschatology determines our theology. This means our exploration of hell is actually nothing less than an exploration into the very heart and character of God. While sin is universal, and sorrow and pain universal, shall not our hope be universal too? Shall not life be as universal as death, and salvation as universal as sin? Can we even think of a divine life and a divine love as other than in their very essence universal? Many of us think our happiness depends on things outside of us. We think that we have to wait to be happy until some of these things are taken care of, but happiness comes from within. It is the best gift we can give the world, because happiness is infectious. Happiness is enlightening, and it gives hope. As a form of love, happiness spreads around. If a situation seems stuck, bringing happiness to it moves it forward, because there is so much creativity in happiness. Cause-and-effect assumes history marches forward, but history is not an army. It is a crab scuttling sideways, a drip of soft water wearing away stone, an earthquake breaking centuries of tension. Sometimes one person inspires a movement, or her words do decades later; sometimes a few passionate people change the world; sometimes they start a mass movement and millions do; sometimes those millions are stirred by the same outrage or the same ideal, and change comes upon us like a change of weather. All that these transformations have in common is that they begin in the imagination, in hope. To hope is to gamble. It’s to bet on the future, on your desires, on the possibility that an open heart and uncertainty is better than gloom and safety. To hope is dangerous, and yet it is the opposite of fear, for to live is to risk.